Shouldn’t that be the Whomfinders? Once again, and for the benefit of folks coming in late, I hate spoilers. A lot. A whole lot. 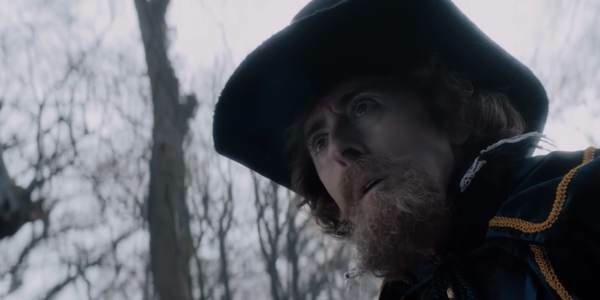 So on the very teensy-weensy chance that you’ve come here and not yet seen The Witchfinders, here’s some spoiler space so you can back away easily and without having the program spoiled for you. Also, this week’s theme makes the choice of clip rather easy to pick. Got home in time for Bluey this week! Hurrah! (this comment will make absolutely ZERO sense for anyone not watching on the ABC at 5:55pm on a Monday, and I care not a jot about this. Bluey is excellent, even though he has nothing to do with Doctor Who. Also, Dads totally deserve hugs. Especially if they do their hamstrings. For the benefit of anyone going “What the hell is all this Bluey nonsense in the Doctor Who review?” Not that this will help much. I’m very much writing this as a stream of consciousness as I go, and publishing immediately afterwards. Which makes for an interesting reviewing experience, if nothing else, because my usual review process is a LOT more detailed and intricate. It’s kind of fun letting the rules go hang. Even before the episode starts, I’ve got a lovely warm rosy glow going, simply because the title of the episode sounds precisely like it could be a Hartnell or Troughton story. Troughton’s my favourite Doctor from the classic series (though clearly, they’re all wonderful chaps, as the Brig used to say), so I’m hoping it’s a glow that can stay with me throughout the episode. Or in other words, the title has a LOT to live up to in my estimation. For anyone keeping track, I’m yet to change my mobile ringtone to the new theme arrangement. But it will happen (when I get time, no pun intended). Speaking of music, I’m loving the use of both strong music and serious silence to create mood this series. Great stuff! The psychic paper/Witchfinder General gag was cute, but it’s starting to feel like it’s a bit overplayed as a narrative element to me. There would be other ways to get to the same result without the magic paper, no? Further mixing of the Doctor/Malcolm lead roles with the assigning of the Witchfinder General role, although nicely in the service of the whole “can the Doctor be a woman” issue. Of course she can! In a classic Doctor Who story, Alan Cummings’ King James would totally be The Master. Mid-story, I’m not entirely convinced it isn’t, but that’s surely deliberate, no? I do get that it’s tough for Malcolm to stop King James… but it almost feels out of character that, at some point, he wouldn’t intervene with more than just a philosophical discussion on the nature of Satan. Tendrils to zombies suggests shades of The Evil Dead. Which is pretty darned dark for teatime viewing! “Honestly, if I was still a bloke, I could get on with the job and not have to waste time defending myself!” – a lovely meta-comment that also works within the context of the historical setting! It was pretty inevitable that The Doctor would be arrested as a witch, though. This is a great looking story that really only needs a forest and a few shacks — must have been quite affordable to make. I’m seriously starting to think that the writing team’s been told to return to the very classic “must be educational” mantra, what with the King James history lesson mid-episode. Not that (speaking as a history graduate) this is a bad thing, of course. The makeup job on the mud zombies looks a LOT like the Haemovores. That wouldn’t be the worst callback this series could do. I’m not sure I love the alien invasion twist; I was actually fine with Becca Savage simply being a nasty person who got her just desserts. The Morax are just another in a long line of aliens trapped on earth since primitive times, after all. Must have been busy on earth around those times. The Doctor is pretty good at getting English royalty offside, all things considered. There’s something of a pattern here. I never thought I’d hear a direct Pulp Fiction reference in Doctor Who, but there we have it. You know what? I’m beyond frothing at the mouth at Rove’s intrusion on the end credits. Of course it’s stupid and annoying and distracting and disrespectful of the many fine people who work on Doctor Who. Yes, it makes me angry with him. But it’s wasted energy. The ABC is just going to do it anyway. And I’m going to hate it anyway. Still, that was fun stuff, even if it didn’t quite hit the classic notes I was hoping for at the start. Also, I’ve decided that I’m far enough into the season that I’m happy to start ranking the episodes based on how good I think there are. We’re yet to have what I’d objectively call a “bad” episode (otherwise known as the “Fear Her” scale, or if you’re old school, the “Delta and the Bannermen” scale), but I’ve definitely got preferences in how each episode has played out. So here’s my rundown so far, from best to what I’ll call “least best”. Clickable links to each of my thoughts in the list if you haven’t read them already, of course. Methinks that list might be just a touch contentious — I seem to know a lot of folks who liked Kerblam! a whole lot more than I did. That’s fine, you see, because this is just my personal opinion. If you’ve got a different opinion, ordering or thought, let me know in the comments below! We can always agree to disagree, like polite society (and The Doctor) would want. Next time: It Takes You Away. Presumably with a soundtrack by Berlin. There was a manic bit of story fill there! – when it went alien-army-in-a-hill – “oh I’m guessing from what she said that it’s banished royals and an army…” Of course! Think you’re right, she could have been more a lone lost alien, more Sarah-Jane or Torchwood level. Planet-saving not required.